I hate posting more than one post in a day because I don't want ya'll to miss anything but I can't hold it in any longer!!!!! So if you missed this morning's post, please scroll down, thanks! So without further ado, the winner is...oh crap! Sorry about that y'all, I looked over and Toot was biting on one of Lebowski's dog toys...flipping fantastic...Yuuuck! Also, happy fun mail for me today, woo hoo! The fabulous Christy sent me this fabulous array of goodness! Um, hello! 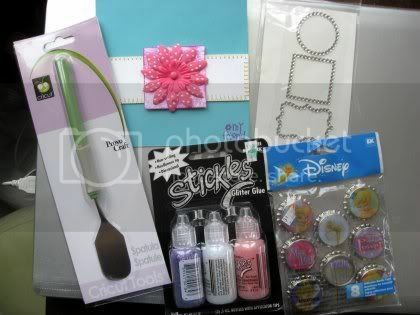 Stickles, blingy embellishment, Tinkerbell stickers AND a new spatula for my Cricut (which I did not have!)?! Does this girl know me or what?!?! Thank you so much Christy, wowowowowow! Speaking of Christy, did you know that she just found out she's pregnant with her first child??? Congrats Christy! If you have time, run over to her blog and congratulate her! Well, that's all for today! Join me next week when you'll hear Toot say, "babababababababababababaaaaaaaaaaaaaaaaaaa!" Bye y'all! Oh! *blush* Well, jinkies I never announced my blog makeover winner, did I??? Merry Christmas in July Sweet Friend! I'm coming to your house this Christmas! Looks like so much fun! I'm going to smooch all over that adorable Toot while I'm there, that is the cutest photo ever!! Thank you for doing this Maggie, it's so much fun and I'm trying to get to everybody...my computer is still being a brat and it's taking forever to download the sites...sigh! OH SNAP! We have a winner! Well, Ms. Karyn, e-mail me at katamommy @ gmail dot com for details! What an adorable video! ^-^ And congrats to Karyn! and you need to tell me how to copy and paste the interger thingy, I can never seem to get it to work like that!!! Grrr! how cute was that??!!! toot is so adorable! Now THAT's a YouTube clip worth watching...simply adorable! Congrats to Karyn!!! OMG! I can't believe it! Oh Maggi thank you so very much! I'm doing a happy dance...no really I am, right here, right now in my tiny cubicle at work! I should stop though...my boss is looking at me like I'm a weirdo! Best Monday ever!! Great big hugs to you and Random Number Generator!!!! Woo Hoo!!! What an adorable video & congrats to Karyn too!! Wonderful news! kidding. congrats to karyn AND miss toot. Oh my gosh, that Toot of yours is adorable! I love that video. Congrats to Karyn, too -- that's so cool. I love her blog. My oh my, what a cutie pie! Toot is adorable, Maggi! Toot is absolutely darling! I miss my kids when they were babies! Oh my, that video is so so adorable. awwwww she's so cute! it makes me want to go wake up presley so i can make her laugh! Toot made me giggle too..lol. That Toot is wondeful.. I miss my girls being little. She is sooo cute!! Thanks for making my night and again, really appreciated all your hard work for Christmas in July!! I'm so happy for Karyn, I think she really wanted a makeover too. Thanks so much for showing us our Toot's on camera, she's just beautiful. Toot cracks me up in that video, she is soo darn silly! Ohhh and Stickles! You lucky girl. I still got to get my hands on some! Thanks for the shout out about the giveaway on my blog. Ohhhhhh, Toot. I am so in love with my little man's giggle too! LOL Totally love the video! 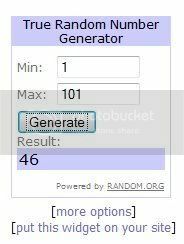 Congrats to your winner! Hey, I am in Vegas and am checking in with the Christmas in July parties as much as I can. I am not slacking! Huge congrats to Karyn, she is such a sweet, wonderful person, I'm super happy to learn she's the winner. Have a marvelous Tuesday, sweetie pie! Loved the Toot video! I'll come back and see it again! Have a good week Maggi! maggi ~ soooo with you on the posting more than once a day,,, im weird about that too,,, its like if i do that, i wont have anything to say tomorrow ~ although im sure i will,,, i just feel that way,,, anyway, as usual your girl baby is soooo cute :-D and congrats to your blog~maker~over winner!!! Hey Maggi... I totally ran out of time for the blog hop on saturday and want to go back and check out the rest of the blogs do you still have a master list? I need the blogs that start with the letter I (if there was one) on down. I did it alphabetical it seemed easier that way lol. Thanks either way! Lovin the video - I've always wanted to hear Toot not only see her! Thanks for telling me about Pile it on. Ichecked it out and going to try it with the next multi challenge I am going to do! Ok, that is freaking hilariously adorable!! I sat there and cheesed like a 3rd grader while watching that video! too cute! and you write so funny! OH!! and I love love your new profile pic..you look HOTT, mama!!! YOW! Very cool. I love stickles.